By car: Parking at 3200 Viau St.
By car: Parking P2 De Coubertin, at the intersection of Pierre-De Coubertin and de la Salle avenue. The Stadium and the Esplanade is accessible via an underground corridor from the Pie-IX Metro station. The Sports Centre and the Tower are within walking distance of the Viau Metro station. With almost 4,000 indoor parking spaces, and another 270 outdoor spaces, our parking lot is among the largest in Canada. The Olympic Stadium, the Tower, and the Sports Centre are easily accessible for visitors with reduced mobility. The facilities are also adapted for wheelchair users. 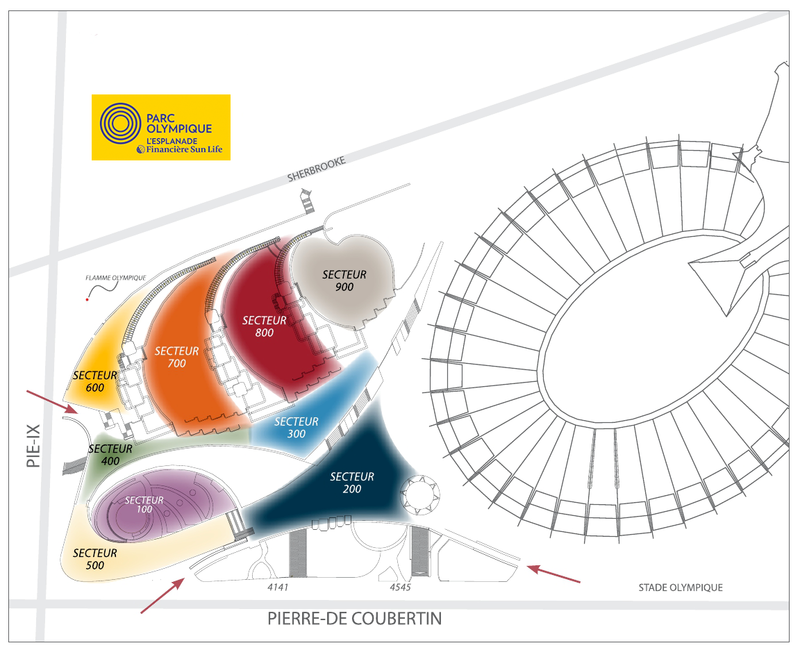 The Esplanade is accessible to people with reduced mobility, and adapted sanitary facilities are available at the administration office entrance at 4141 Pierre-De-Coubertin ave. for anyone who uses a wheelchair.